The child’s artwork is complete when an inner level of development has been reached. Almost without any outward sign, the little artist puts down her crayon or paintbrush and walks away. She is done. She might even forget the picture on the table, or drop it en route to her next activity; she might give the picture away to a friend. There is no attachment to the end product. If there is, it is likely because the child has been requested by an adult to do a painting for them. Children are natural artists. We do not need to teach them how to draw. Their freedom for expression is intact and simply requires the proper tools and open-ended space to explore. 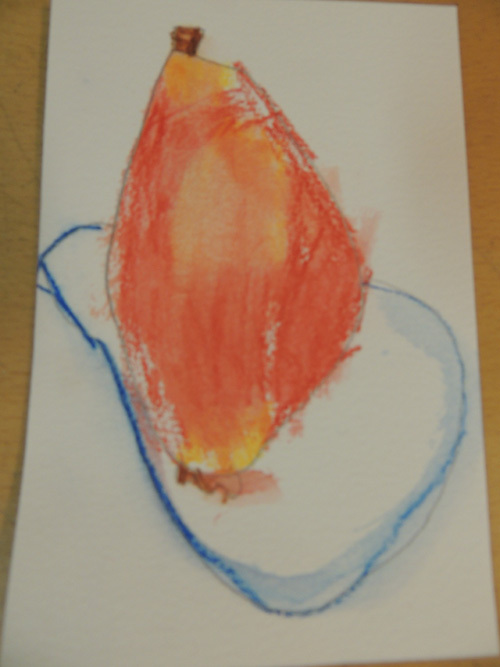 Through art, the child communicates feelings, explores shape and colour, creates ideas, and develops fine motor skills. The Montessori approach to art reflects these needs. The shelf is stocked with a variety of mediums to work with: pencils, pastels, clay, scissors, glue, brushes, paint, and different types of paper. Lessons are given in the use of the artists’ tools, introducing the techniques and language of the genre: Impressionism, cubism, pointillism, sculpture, fresco, palette, brushstroke, bronze, crimson, cerulean, ochre… On the wall hang beautiful reproductions of artwork representative of various artists, eras, countries, and styles. The Montessori teacher prepares a classroom environment that inspires, then steps back and observes the child at work. 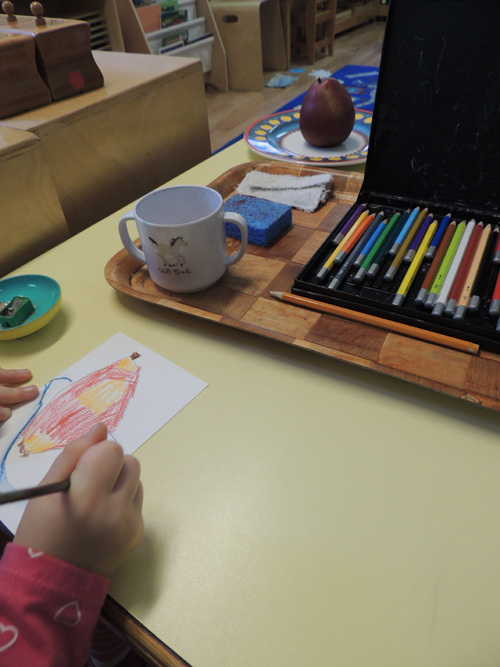 This photograph depicts a four-year old using water colour pencils and a paintbrush to record her impressions of the pear on the decorative plate.